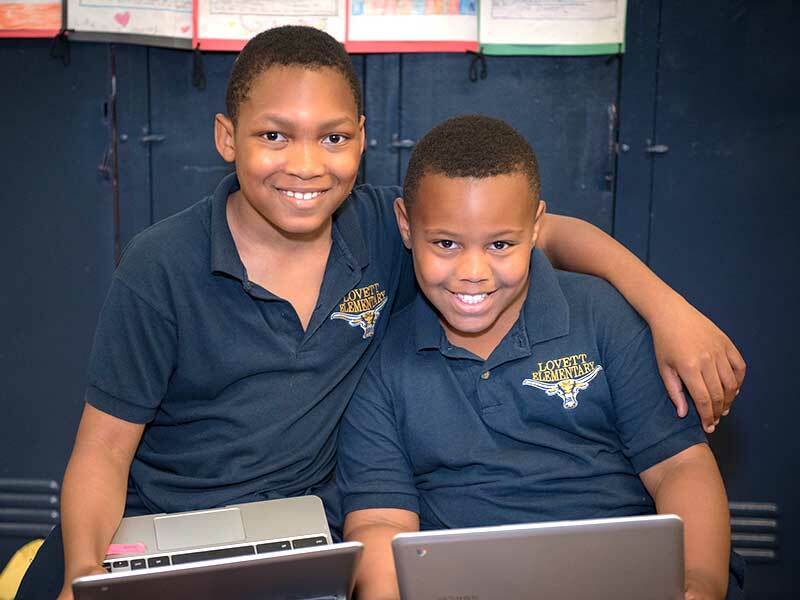 Lovett differentiates at a macro-level through skill-level classes, but also goes a step beyond differentiated instruction at the class level by differentiating instruction within each class as well. Station rotation is a common approach to differentiation for Lovett teachers, especially those in the 2-3 learning pod. Teachers identify students with similar needs and provide them with targeted small group instruction while other small groups are working independently, collaboratively, online, or with another educator. This depends on how the teacher structures the rotation. In the 4-5 pods, more differentiation happens at the individual level. Students work on a range of skills and concepts throughout the class, progressing at different paces. 4-5 educators are able to identify trends and create targeted instruction opportunities for small groups, while other students are working based on their individual preferences. Provides feedback on academic progress and needs through conferencing and assessments. Rotates instructional stations based on teacher groupings in 2-3 pods. Chooses what they are working on (from a list) and how best to progress through it, and receive targeted instruction as needed in 4-5 pods. Identifies student needs through weekly, and sometimes daily, data analysis and continual class observation within each grade band team. Groups 2-3 pod students based on need and provides targeted instruction via the station rotation model. Provides 4-5 pod students with targeted instruction in small groups while the rest of the class works based on their individual preferences. Differentiates types of instruction for 2-3 and 4-5 pod students to offer multiple learning modalities, including: visual, tactile, auditory, and interactive. Offers increased differentiation to 2-3 and 4-5 pod students which incorporates student interests and needs. (Student interests are usually identified in conferences and Learner Profiles, so teachers might see that a group of students is interested in sports and look for resources that are sports themed). Provides data for teachers and students to better understand needs. Provides a shared platform through Learner Profiles for students and teachers to discuss student progress and needs.